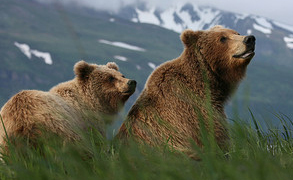 Bear Viewing Tours to Katmai Coast, Remote Brown Bear Viewing Day Tour to Katmai National Park. Spectacular Brown Bear viewing along the remote Katmai Coastline from Homer. Hallo Bay is the only Eco-sensitive facility of its kind designed exclusively for bear and wildlife viewing on the 485-mile long Pacific Coastline of Katmai National Park. Overnights in wall tent camps for small groups within a stunning mountain coastal bay. Nowhere else in the world can you observe with a naturalist guide up to 100 wild brown bears coming and going throughout the day and have the possibility of photographing a group of 40 or more bears at one time. Excellent brown bear viewing day and multi-day package from Homer. Hallo Bay is an eco-friendly camp located 120 air miles southwest of Homer, Alaska on the wild and remote Pacific Coast of the Alaska Peninsula. The Alaska Peninsula is a part of an area called "The Ring of Fire" a volcanically active chain of volcanoes located on the leading edge of the Pacific Tectonic Plate. There are no access roads within 300 miles walking distance of Hallo Bay. On the Alaska Peninsula, Hallo Bay is approximately 25 miles south of Cape Douglas and 6 miles east of Kaguyak Volcano. Hallo Bay Camp is located a stones throw from the Pacific Ocean and surrounded by the 6400 square mile Katmai National Park on the remaining three sides which also has no roads leading to it. Hallo Bay has one of the most beautiful beaches and wildlife viewing areas in Alaska. The variety of bear viewing areas offer many different opportunities to observe Alaska's coastal brown bears in their natural habitats. Big River and Clint's Creek, which are located to the north and south of the Camp respectively, produce an excellent variety of seasonal salmon runs. 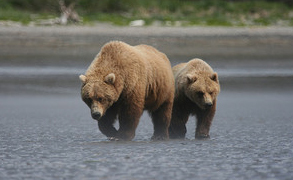 The coastal tidal flats offer good clam digging and sweet sedge grass meadows for the feeding brown bears. 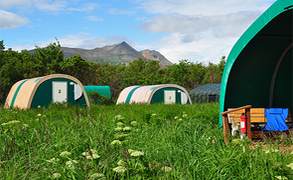 Hallo Bay is the only Eco-sensitive facility of its kind designed exclusively for bear and wildlife viewing on the 485-mile long Pacific coastline of Katmai National Park. There are no public services, marked trails or airports available in Katmai National Park within 70 miles of Hallo Bay. The Mc Neil River Wildlife Sanctuary located 30 miles north of Hallo Bay is the only other facility equal to Hallo Bay offering eco-responsible, sustainable and unspoiled wildlife viewing in the entire Southwest Alaska coastal brown bear habitat areas. A typical day at Hallo Bay: Get ready after breakfast for a full day of exciting brown bear viewing. Your lunch will be packed by the cook in preparation for your outing for the day. We start for a guided walk to the bear viewing areas. (5-6 hours and 3-4 miles average, difficulty level - moderate walk). If on any of the days the mid day is hot, we will take an afternoon break at Camp. This time is planned as an opportunity for you to relax around camp, and have a early dinner. In most cases, this is the warmest time of the day and wildlife is generally inactive because of the temperatures. After supper, the guide may take the group out to the bear viewing areas again to enjoy more opportunities to observe and photograph bears and wildlife for a few more hours. When you get back to the galley in the evening after bear viewing, on cool evenings, the fireplace will provide a cozy warmth while we talk of the day. The guests can lounge around the galley discussing the days adventures, down load their digital images on their computers or relax in the galley with a nice cup of coffee or hot chocolate. The guests can spend the evenings after supper playing cards, enjoying board games, reading a good book, putting together puzzles, or falling asleep in their cabins to the sounds of the evening song birds, light breeze and the incoming tides. Hallo Bay provides the guests with three, hearty, family style meals each day. If you wish alcoholic beverages during evening meals, you will need to bring these with you as we do not supply them. We provide large, comfortable, heated weatherport cabins. Each cabin has two large cots, mattress pads, sleeping bags, pillows, table and chairs. Personal products such as towels for the showers, shampoos and soaps are not supplied by Hallo Bay and are the responsibility of the guests to bring. We operate an environmentally friendly eco camp. Products that we use and that the guests use should have the environmentally friendly label on the products. You can purchase environmentally friendly shampoos, conditioners and bath soap products at local health food stores or sporting goods stores in your area or in Homer before you fly out to our camp. Fly-in from Homer with a wheeled Cessna 206 (departure between 8:00 AM - 11:30 AM) and enjoy the beautiful and scenic 1-hour flight, which terminates with a beach landing 200 feet from our facilities where Camp personnel will be awaiting your arrival. Each guest is restricted to the 250lb weight restriction and that includes the guest's body weight, camera gear and luggage. Or if you are traveling as a couple, the combined weight can be up to 500lb. A thorough Bear Safety Orientation will be conducted by your Hallo Bay Staff. Including a mandatory description of how the guides and guests will conduct themselves while traveling through bear habitat and during bears encounters.